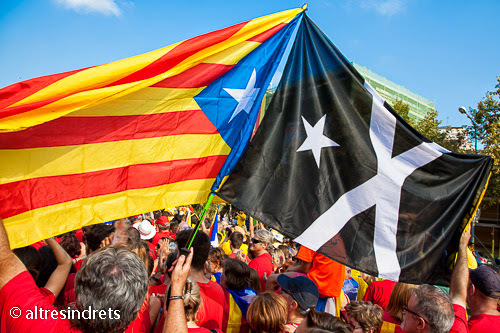 In July 2014, the Museum of History of Catalonia, Barcelona, presented the Tricentennial flag, a black flag charged at hoist with a white star and in the center with a white saltire (photo, photo). The flag (photo) was pushed by the Reeixida Foundation, founded in 2004, as part of a "rehabilitation of the banners of the War of Spanish Succession". Exhibiting a straightforward independentist message, the flag was hoisted on 11 September 2014, the National Day of Catalonia (Diada) by 34 Catalan municipalities, and on the same day in subsequent years (photo, photo). The flag was subsequently used in several street demonstrations (photo, photo, photo). The flag commemorates the hoisting on 1 August 1714 of a black flag by the defenders of the castle of Montjuïc to indicate to Philip V's troops that they would resist until death. More generally, the black color recalls the flags used during different insurrections in Catalonia. The star recalls the estelada independentist flag, while the saltire is the Cross of St. Eulalia, Barcelona's co-patron saint. The cross is formed of two letters "V", meaning "Votar" [Vote (for independence)] and "Victoria" (Victory).